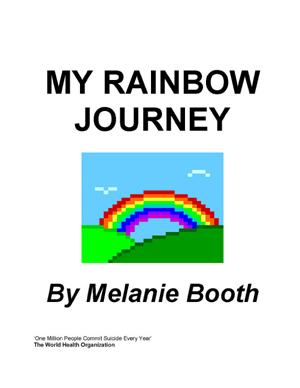 Part poetry collection, part autobiography and self-help book 'My Rainbow Journey' is an account of Melanie's experience of bi-polar. Melanie's poetry is vivid and imaginative, her autobiography is instructive and education. Melanie has also included a short guide which is is aimed at fellow sufferers. An interesting and varied book, there is something here for everyone. I’m Melanie and I have had bi-polar disorder since being a teenager. Now 35, and living in Sunderland, (my birth place), I now practice complementary therapies, having gained qualifications in massage and reflexology. I enjoy art and crafts, especially silk and pottery painting, and writing poetry. I am involved with a mental health project, where I am an active volunteer and Committee member, and sometimes attend the art group and Relaxation class held there. I do the administration work in the local respite home for the disabled. I enjoy meeting with friends and family, and spending time with my nephew and niece. I’ll live with Him eternally. I hear Him say, “Look unto Me for I am near". No longer you, the price must pay. Sound blessing and true peace of mind. And I shall be made whole. There comes a new dawn.